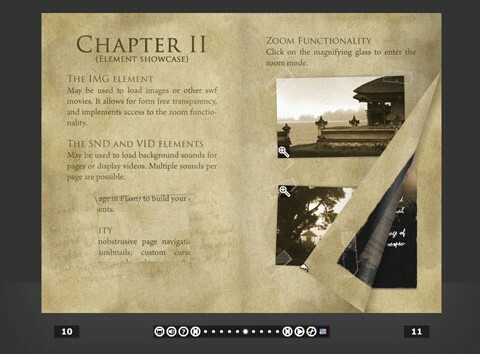 MegaZine 3 is an open source pageflip/flashbook engine, written completely in AS3. It generates an interactive book, which can then be flipped through by the user. MegaZine 3 uses a completely dynamic approach, allowing full configuration through an external XML file. This makes it easy to set up books even if you do not even own the Flash IDE. MegaZine 3 automatically generates a control bar that allows jumping to every individual page. It also generates thumbnails for the pages, to make it easier for the user to find a page again, or getting a first impression. Amazing. I was looking for something like that! I currently don’t have a use for this, but I’m so impressed with it from a design & feature standpoint that I’m tempted to make a donation anyhow to support it. hey friend this is really very nice…. AWESOME. This blows away any other similar product I have found, including all of the closed-source for-profit ones. Very well done.